Doug and Glen with their 62 lb Stripey! 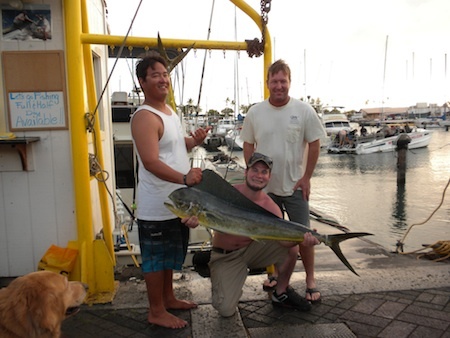 Mahalo, Doug and Glen for choosing Maggie Joe Sport Fishing! It was another great sport fishing tour aboard the Maggie Joe with Captain Mike, Mark and Deckie Johnny-Bobo. They hauled in this nice Striped Marlin while deep sea fishing outside of Honolulu, Oahu! Hana Hou guys! Doug and Glen with Catch! Mahalo to Doug and Glen for joining us aboard the Maggie Joe with Captain Mike! The guys had a nice day on a sport fishing charter after an early start, departing Kewalo Basin next to Waikiki, in the early morning hours. They caught a handful of Mahi Mahi, Ono and Aku while deep sea fishing outside of Honolulu, Oahu! They’ll be back the next day… so let’s wish them luck! Crystal, Monty, Marc, Eric, Erin and Roger with 288 lb Blue Marlin and Mahi Mahi! 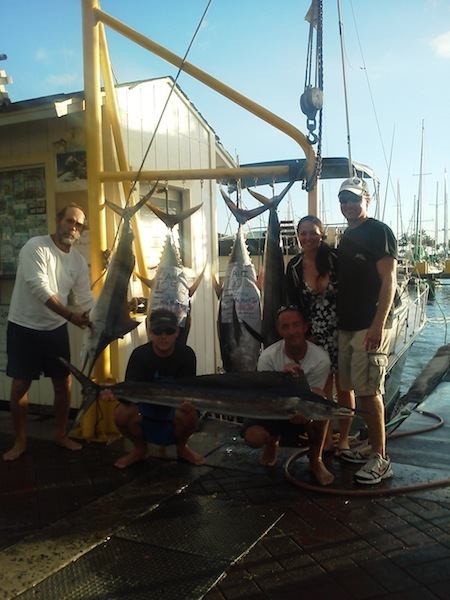 Mahalo to Angler Eric, Crystal, Monty, Marc, Erin and Roger for choosing Maggie Joe Sport Fishing! The group joined us aboard the Sea Hawk on a sport fishing charter with Captain Darryl. It was a great day as Eric hauled in this nice 288 lb Blue Marlin while deep sea fishing outside of Honolulu, Oahu! Hana Hou! 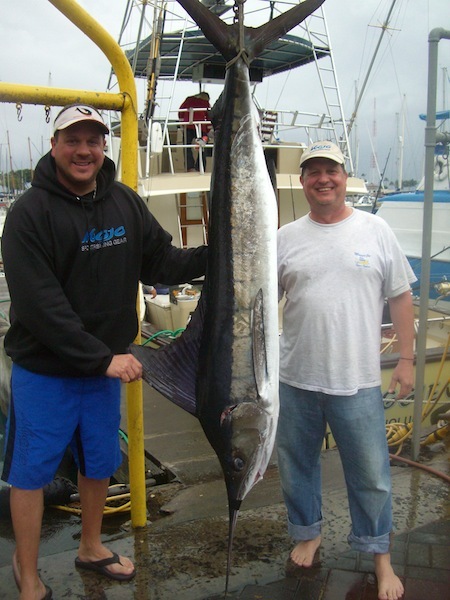 Mahalo to Nick and Gary for choosing Maggie Joe Sport Fishing! The guys joined us aboard the Sea Hawk on a Honolulu sport fishing charter. They caught this nice size female Mahi Mahi while deep sea fishing outside of Oahu, Hawaii! Aloha! 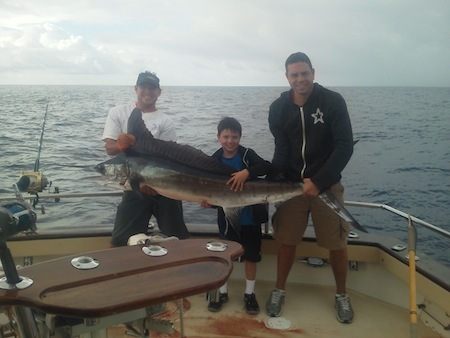 Mahalo to Rocky, Victor and Dallas for choosing Maggie Joe Sport Fishing! Their Oahu sport fishing charter turned into a great day out on the water. The guys hauled in a handful of Mahi Mahi and Ono while deep sea fishing outside of Honolulu, Hawaii! Aloha and hana hou! Mahalo to Rayna, Chris, William and Matt for choosing Maggie Joe Sport Fishing! 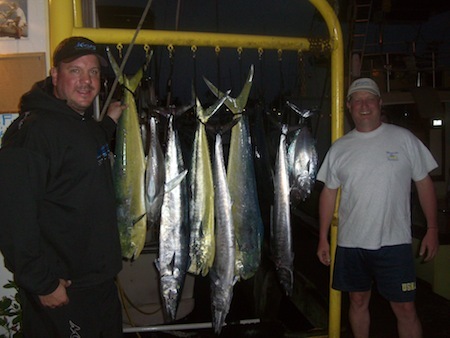 The group joined Captain Matt and Mate Billy aboard the Ruckus on a sport fishing tour. A great day on the water produced a handful of great tasting Mahi Mahi and Ono while deep sea fishing outside of Honolulu, Oahu. Aloha and Hana Hou! 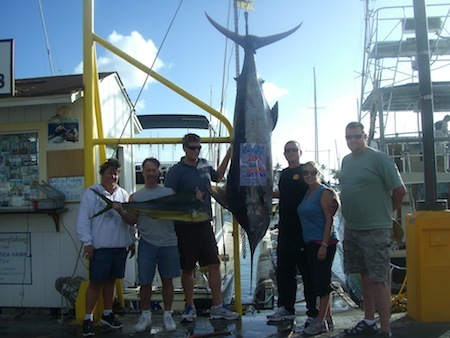 Mahalo to Ike, Monica, Rick, Marry, Roddy and Jim for choosing Maggie Joe Sport Fishing! The group departed Kewalo Basin, next to Waikiki, in the early morning of February 14th aboard the Sea Hawk with Captain Darryl on a sport fishing charter. 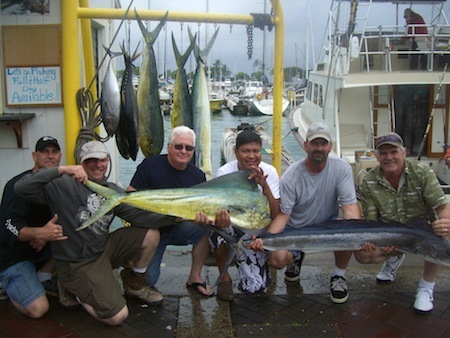 While deep sea fishing outside of Honolulu, Oahu they hauled in a nice 220 lb Blue Marlin and a boatful of Mahi Mahi! Hana Hou and Aloha!